Mandy Northcutt was a group exercise coordinator and certified personal trainer before deciding to pursue higher education as a career. “I’ve always enjoyed working with other individuals and teaching them about human movement or different exercises,” she says. She enjoyed the academic environment while earning a master’s in exercise science and wondered if she would enjoy teaching as well. Now a temporary instructor at Arkansas State University, Northcutt loves her job and hopes to become a professor. She’s in the 2017 cohort of the online Doctor of Education (EdD) in Kinesiology program at UNC Greensboro to gain eligibility. Northcutt knew she wanted to enroll in a well-known and reputable program. The interdisciplinary EdD degree has a solid reputation thanks to its experienced, distinguished faculty. Students receive research training and collaborate with faculty and peers in a supportive online community. As a working mother of six, Northcutt also needed a program that was flexible for her family. She didn’t want to uproot them for a degree or lose state eligibility as a foster parent. She and her husband have two biological children, legal guardianship of one child, and have recently adopted triplets from the foster care system. Thanks to the online EdD, she can be there for her family, work, and fit coursework into her schedule. The fully online format allowed Northcutt to leave the country recently and continue to communicate with her group to finish a project. The program sets students up immediately to understand the technology. That technology helps her group stay connected in different time zones. They use Google Hangouts and video conferences almost daily for assignments and anything else they need to talk about. If Northcutt doesn’t understand an assignment, she’ll ask for others’ perspectives. Sometimes students reach out to each other for feedback on handling work situations. Sometimes they need to reach out for more personal reasons. In a short time, the cohort has had deaths, hurricanes, marriages, births, and adoptions touch their lives. “We have been blessed to have each other through these experiences,” Northcutt says. The instructors inform students about upcoming work, due dates, course expectations, and the quality of work they expect. This helps Northcutt plan ahead, making time for assignments in the evenings. 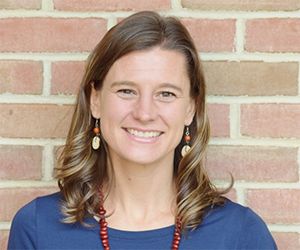 In her second year of the EdD program, Northcutt is already seeing results. She’s learned about assessment, developing and creating a strategic plan, types of leadership, and how to meet students where they are in their learning. “Especially with online pedagogical methods, we have learned how to develop a course and then the different strategies and methods to implement to engage the student just like you would in a face-to-face classroom,” she says. Because her background is not in teaching, learning curriculum design has been instrumental in seeing how to design lesson plans to fit a specific purpose. Northcutt has learned to look at how she teaches and looks at the curriculum, and whether it is relevant to the content. Instead of focusing on how students can use material in the future, she sometimes needs to ensure they understand basic concepts first. They will build on them later. Focusing on scholarship and professional practice in leadership, advocacy, and teaching, UNCG’s interdisciplinary EdD in Kinesiology program is for practicing professionals with three or more years of experience in kinesiology or related fields. Download a brochure to learn more. As head strength and conditioning coach for the NHL’s Carolina Hurricanes, Bill Burniston is still thinking about his future. With more than 25 years of experience in athletic enhancement and injury prevention, he plans to teach at the university level when he is done with clinical work. It’s not unusual for students and faculty to work together on research. Doctoral students regularly engage in this process while working with faculty on campus. How does this work for students in online degree programs? 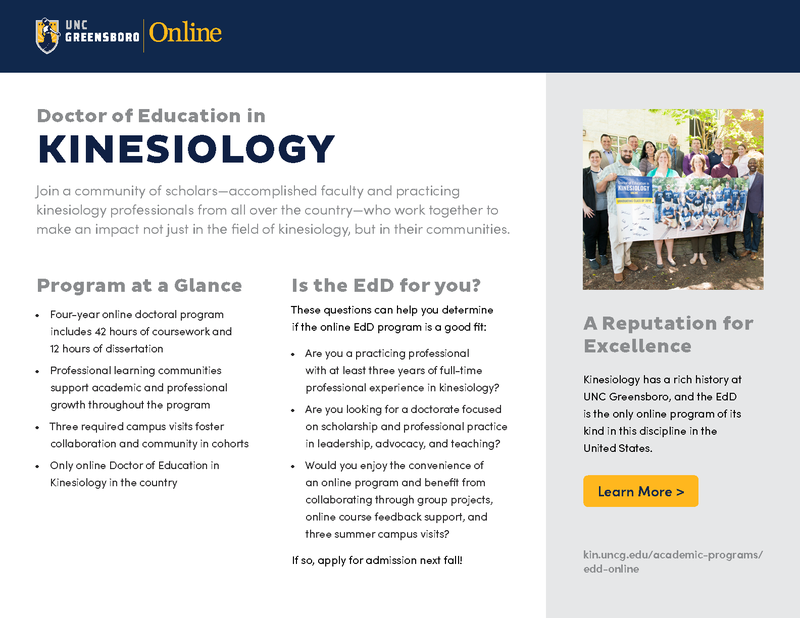 In the fully online Doctor of Education (EdD) in Kinesiology program at The University of North Carolina at Greensboro, distance doesn’t get in the way of collaboration and support.